In some scenarios, companies use different systems and have their data spread to many servers or applications. If you want to use Microsoft Office 365™ and you f.e. provide your own system for registering users or assigning Office 365 licenses like a student web portal, a company intranet, an Enterprise Warehouse System or similar systems, Delegate365 API is your interface. This is an optional add-on for Delegate365 with a Web API running in Microsoft Azure, which is capable performing background operations against Microsoft Office 365. The API gets data for user operations from your backend system (usually a document in JSON format), fulfills all tasks and returns success or possible errors, like "user already exists". 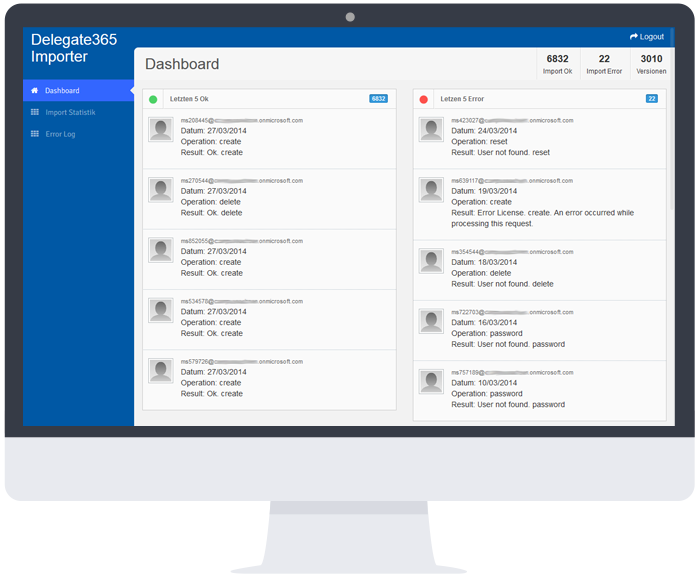 The Delegate365 API also offers a web-based interface for specific admins for monitoring the accomplished operations. With Delegate365 API, Microsoft Office 365 can easily be part of your backend systems! Delegate365 API provides an easy way to automate and control user and license management operations from your own systems without the need of dealing directly with the Microsoft cloud services and all their specific properties and peculiarities. The Web API encapsulates all operations in a black box and provides an easy-to-use interface for basic user and license management. If you are interested in this feature, please contact us. All Microsoft® product names are either registered trademarks or trademarks of Microsoft® Corporation in the United States and/or other countries. All content on this website are subject to change without notice. All prices in USD or EURO excluding VAT. Errors and omissions excepted.